Can Anyone be Too Young for Technology? Should technology come with an age limit? As technology becomes more prominent in our daily lives, this is a question many of us are bound to consider. In this blog, we have previously discussed how important it is to get older people online (https://www.horizon-globex.com/the-importance-of-getting-older-people-online/) and how technology can be used as a learning tool (https://www.horizon-globex.com/how-some-technology-can-help-children-to-develop-and-learn/). We are living in a digital age where most toddlers are comfortable and familiar with the use of smart phones – they know that they have to swipe and touch the screen to make it respond and it is probably the source of their favourite TV show when they are out of the house and need to be calmed or quietened. Just as the TV is often cited as an electronic babysitter, smart phones are used in the same ways, with many parents having a kid friendly mode enabled and having as many children’s apps on their device as they have apps to represent their own interests. The question is though, are we relying on it too much and should there be an age limit on when children become exposed to technology? 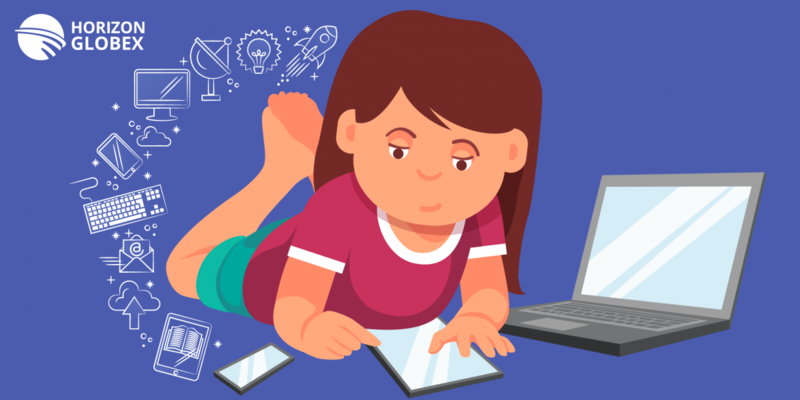 In terms of quick fixes and easy distractions, technology probably is over relied upon, but it is also next to impossible not to expose a child to technology when it is all around them in every facet of life. Paediatric Occupational Therapist, Cris Rowan, the author of “Virtual Child: The Terrifying Truth about what Technology is Doing to Children” told Brain World Magazine that an over dependence on technology can impair the development of a child under the age of two. The American Academy of Paediatrics also recommends limiting screen time for those aged between two and six years of age to less than two hours a day. Technology can be used as an educational tool for children, but that is really limited to school going age and just before it, so it is recommended not to expose very young children to technology on a regular basis.